One must assume that Blitzer thought he was being clever by posing a question that he likely saw as witty and light-hearted. It wasn’t. Aside from being strange, the question showed how little Blitzer knew about Hollywood (it’s not exactly original to cast Kingsley in a biopic about the leader of an Asian nation trying to unite his people at a time of great change and conflict), race (getting the Academy Award-winning actor who played an Iranian immigrant father and one of the most recognisable Indian men on the planet to play the Afghan president), and typecasting. When the interview finally aired, it was that final 20-something seconds that made headlines in The Politico and RFE. Now, five years later, Karzai Blitzer finally got his wish with Netflix’s War Machine a satirical send-up of the Michael Hastings profile and book that took down General Stanley McChrystal and effectively put an end to many of counterinsurgency strategies he was so fond of in Afghanistan. 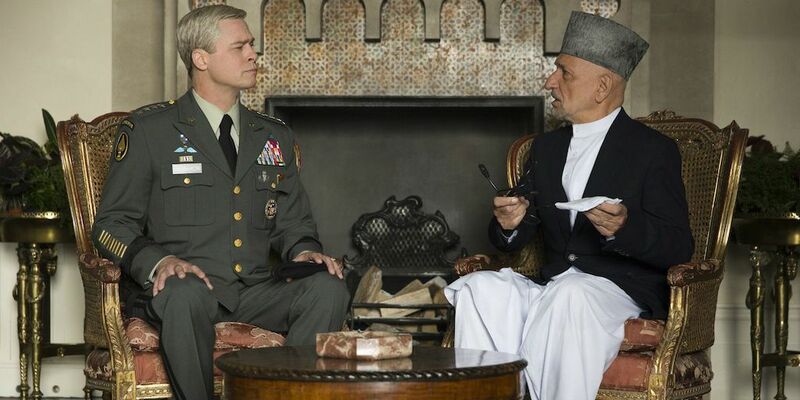 As a take on the inherent flaws of occupation and the political calculations behind the United States’ perpetual foreign interventions, War Machine is a perfectly serviceable film, but there is one glaring flaw in it, Kingsley’s portrayal of Karzai. In Kingsley’s hunched over, snivelling portrayal, even Karzai’s iconic chapan (now housed in the British Museum) and karakol, once symbols of a towering, stylish man, lose all their magnetism. They go from signature, stand-out pieces to the attire of an overgrown child playing dress-up in his father’s closet. Beyond that, the bulk of other scenes of Karzai as played by Kingsley show the leader of a nation 30 million people crawling on the floor trying to setup a new DVD player (in 2009, no less), sick in bed and suffering from sneezing fits. 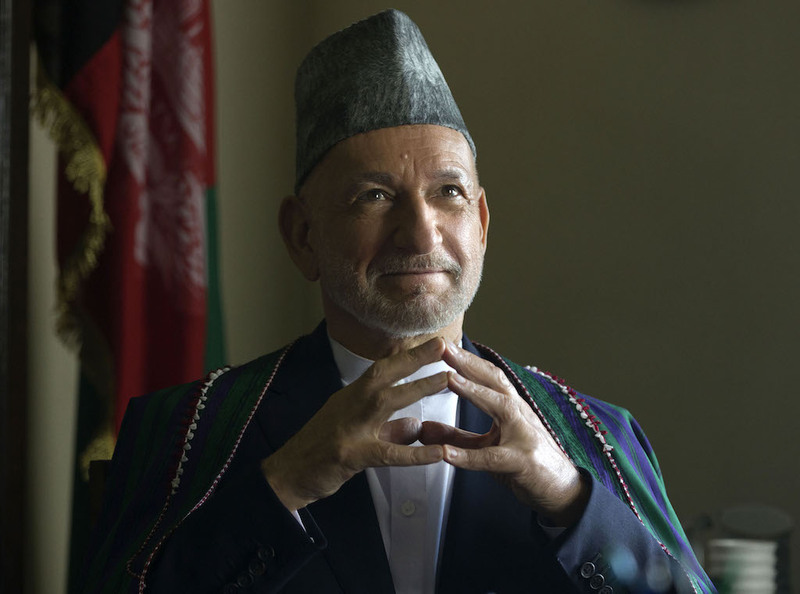 In short, Karzai looks ridiculous. The caricature of Karzai is particularly disappointing given the fact that he is one of only a handful of Afghan characters with actual speaking parts. The other Afghan characters, offer some insights into the Afghan side of the war, but the leader of the nation is made to look like the Kandahari version of Tootles in Hook, a character who is literally famous for losing his marbles. Of all the other Afghan characters, Aymen Hamdouchi’s Badi Basim fares the best. When we first meet Basim, he has just arrived at the gate of the headquarters of the international coalition in Kabul. He is immediately treated with suspicion and derision despite being called to service by the top US general in the country. He is forced to have his bags searched, he is asked where his car is (he chose to walk) and is treated with none of the respect he thought his position would earn him. In many ways, Basim is essentially McMahon (and the film’s) token Afghan. But there are moments when McMahon seems to take a very real liking to Basim. That odd relationship between McMahon and his Afghan National Army officer friend is best embodied during a state dinner in Paris when a US military officer wanting to get McMahon’s attention, takes Basim’s seat next to McMahon and forces Basim to sit in his seat, several tables back. When he realizes that Basim is not next to him, McMahon demands he be returned to his rightful seat. While awaiting Basim’s arrival, McMahon points out what a shame it would be to be guests at a dinner for Afghanistan without a single Afghan present at their table. As his team quickly points out, however, the Afghan ambassador, seated across from McMahon, is also Afghan. Like the ambassador, the other Afghan characters are mainly nameless and wordless. It’s a trend that is only broken in the last half of the film when a group of frustrated US Marines (including one who speaks of both the country and the people with utter disdain) accidentally shell a civilian house in Helmand. It is only then that the Afghans Corporal Billy Cole (Lakeith Stanfield) spoke of with a mix of disinterest and contempt earlier in the film, are finally given a voice. We see scared families huddling in corners, elders telling the US forces to leave their villages because their presence will only bring more trouble to them and McMahon and his men giving blood money to the family of a slain civilian. It’s an odd twist that a scene depicting exactly the kind of behavior Karzai so often spoke out against is what finally balances the portrayal of Afghans in a movie about war in Afghanistan. It’s just too bad they couldn’t manage to do the same for the Afghan president.